It’s no secret that coach bus rentals in Toronto offer travellers the best value for their money. With airfare rates increasing, planes overcrowding and extremely long wait times at the airport, travelling by Can-ar Coach bus rentals in Toronto and the GTA has proven to be the most economical way to get to your destination, saving your time and money to spend where it matters most! Whether it’s 10 hours or 30 minutes, you’re inevitably going to dread having your legs cramped up in any airplane cabin. Can-ar Coach is happy to offer comfortable seating for even your shortest journeys. No hidden fees, no baggage charges. Coach bus travel is often far more economical than some of the low-cost airlines out there now. Can-ar Coach will work with you and your group to organize and collect travel fare. When you’re saving on travel, you free up funds to do more of what you love — shop, eat and explore! Besides any chartered tour that you organize with your group, Can-ar Coach travels a number of routes daily for the convenience of our valued clients. Visit this page to check out our daily trips. Can-ar Coach is happy to take you where you want to go, when you want to go. 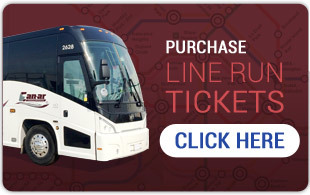 You may be thinking, “A bus takes so much longer than a quick flight.” If you’re lucky, this may be true, but when you add up connection times and layovers, indirect routes that cater to an airline’s needs instead of your travel plans, and the time it takes to get around maze-like airports, the time investment in transit are significantly reduced. When you travel with Can-ar Coach, you’re traveling with a company that makes safety a priority. All of our luxury coaches and buses are kept in excellent working order and undergo regular maintenance to comply with Ministry of Transportation requirements. Our state-of-the-art facility is equipped with the latest technology for servicing and repairing coaches, buses, trucks and other large-scale, diesel-engine vehicles to ensure our fleet is in peak condition.